How did I shot this image ? In this article I will tell you what is the story behind the picture I have taken. I hope it can help you understand and learn what is going thru my mind when I am outside shooting during my travels. This image has been taken during the Rajasthan travel photography workshop in November 2016. We are in the rat temple in the little city of Deshnok approximatively 30 km from Bikaner in the Thar desert. This rat temple is called Karni Mata Temple. Here Hindous are worshiping rats. Around 25 000 of them are living in the temple and are revered here. how hindous were doing there rituals and prayers. I soon noticed that all of them were always going around the temple using a small corridor painted in a rich purple color. I though this would be a perfect spot to wait and take pictures of people passing by. I realized that some of them where kissing the wall while doing a last prayer. I than knew that this was what I wanted to capture. I moved forward to be closer to the exact place where they were touching the wall of the temple and waited till I could get the perfect frame. While waiting there I could make a few adjustment shots so that I could set the exposure right. I wanted to include other people in my composition in order to give some depth and add information to the image. I also waited till a yellow sari came in order for the woman to clearly stand up from the purple colored wall. This is why you sometimes have to be very patient. And when it happened I tried to be very careful to perfect my composition in order to put every woman visible in the picture. I clicked not more than 3 pictures because the moment didn’t last very long. You have to be ready and fast in adjusting the framing. When I got the shot I finally moved out of the temple to breath some fresher air ! 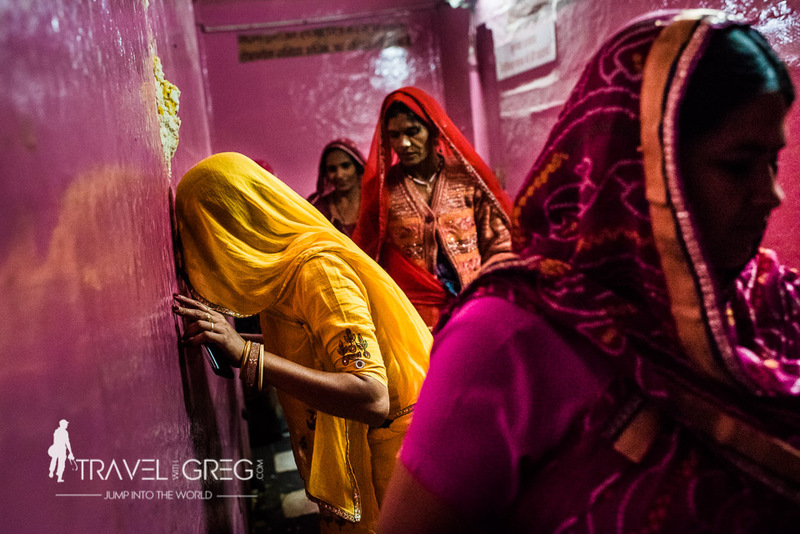 More informations on my Rajasthan travel photography workshop and tour !